In the past, my irrigation articles have gotten a lot of interest, so I’m writing today to share some of my more recent developments on the topic. Click Here and here to link back and check out the older ones again. 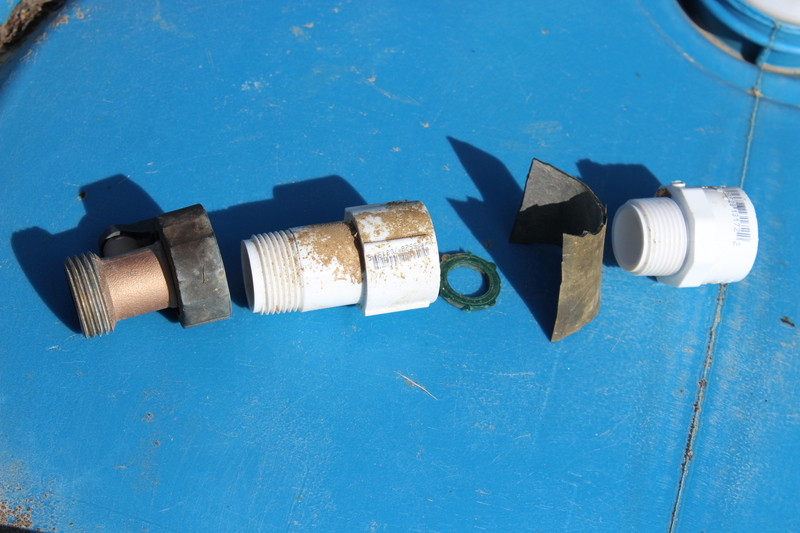 The PVC fitting on the right is inserted through the 1″ hole from the inside of the barrel. Its kinda tricky to do. 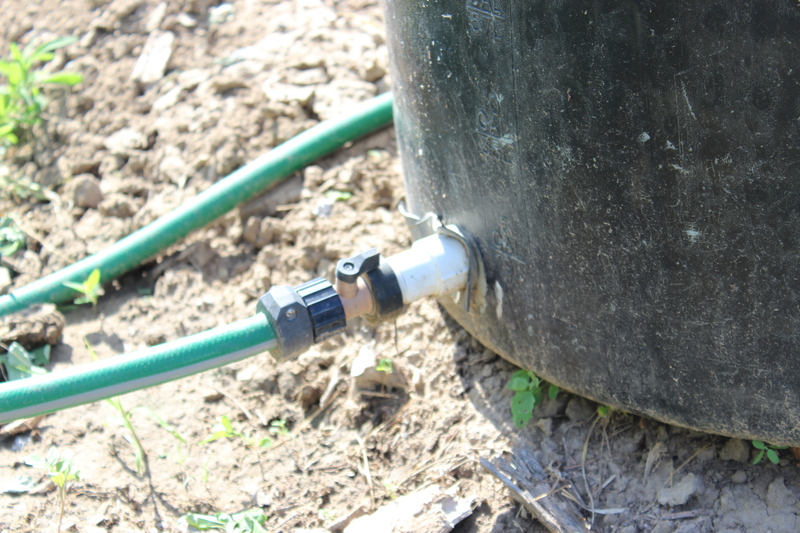 I use a long flexible wire that I feed in through the bung, and then out the 1″ drilled drain hole. Then put that fitting on the wire and it slides down to the hole. Insert your pinkie into the threaded fitting to pull it through the hole until enough thread is showing on the outside that you can put your gasket on and then thread on the second, longer PVC fitting. The gasket is the second item from the right. It is a section of tire inner tube that I cut down. Use another of your fittings to trace a circle at the center of the inner tube and then carefully cut it out. Don’t do a sloppy job on this part, if you do, you’ll end up with leaks. The gasket needs to seal all the way around. Next item in the picture is a hose washer. Insert that into the female threads on the longer PVC fitting. Then screw them together. Once you’ve got it fairly tight, you’ll notice that the fitting on the inside of the barrel is spinning as you tighten. You’ll never get it tight enough to prevent leaks unless you can hold that internal fitting still. I solved that problem by duct taping a medium sized crescent wrench to the end of a hoe handle. You can then lower the crescent wrench through the bung to reach the fitting from the inside. The fitting has a hex flange on it which makes this possible. Now you can tighten the two down. Last, I install a brass valve on each barrel. This allows you to shut off the supply line in case you need to repair drip tapes, etc. Or you could also do your irrigating, then fill the barrels again and shut of the valve. When its time to irrigate tomorrow, the barrels are all full and ready to go. This could help you out when you know you’ll be in a hurry the following day. Do any of you have a similar setup that works for you? I’d love to hear about it and compare notes. This entry was posted in Gardening and tagged 55 Gallon Barrel, conservation, drip irrigation, drip tape, water, water wise, watering. Bookmark the permalink. Where does your water come from? 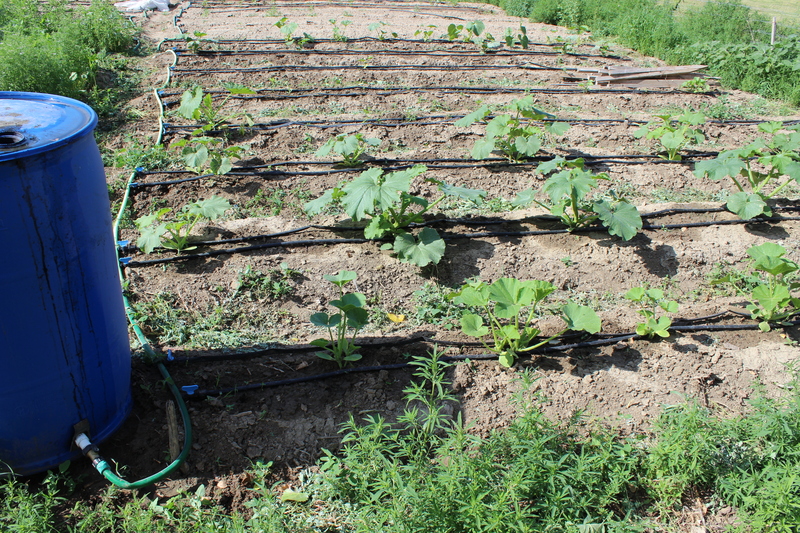 Are you harvesting rain water? Anyway, I use the back to eden film way of conserving rainwater. With a six-inch wood chip mulch in fall, by spring with rain well preserved under the mulch, there is little or no need for watering my garden for summer. It also stops weeds and as it degrades is your fertilizer from year to year. Elizabeth, we don’t use rainwater, as we haven’t constructed a system for that. Sounds like a great project for the future, though. I like your idea about deep mulch, too, as a way of reducing evaporation. This is exactly what I was looking for! Thanks so much for breaking it down, and providing the detailed pictures. Like the previous commenter, I have a deeply mulched woodchip garden, but I’ve had problems with our brief rain showers not penetrating the woodchips, they almost seem to act like a barrier. I guess every climate is different- if we could get a good soaking rain I’m sure the woodchips would help hold it in, but with our usual weather pattern of a shower every evening in summer, I definitely needed a solution. This seems like it will be wonderful, and I already have a lot of the materials. Thanks again! Cindy, based on what you said, I’m thinking that one may want to run these tapes underneath a heavy layer of wood chips. That way the plants still have access to water and then the chips help retain the water in the soil.